In doing so they engage in aesthetic debates about the sublime since antiquity and especially the 18th century and in the recent theoretical discourses of the Anthropocene. They also return to the very beginning of the history of radio as an institutionalized medium. The first radio plays that were broadcast in Europe in 1924 all dealt with catastrophes: “Danger” by Richard Hughes takes place in a mine where a couple and an old man get trapped, “Maremoto” by Pierre Cusy and Gabriel Germinet tells the story of a shipwreck and “Zauberei auf dem Sender” by Hans Flesch depicts a chaotic disruption at a broadcast sound studio. The German media theorist Bernhard Siegert states that catastrophe plays are important from a media-epistemological perspective because the radio reflects and investigates itself within this genre. By staging its own end, the medium becomes visible and audible, Siegert argues. But catastrophes as extreme sensations always have been a genuine topic for radio journalism. 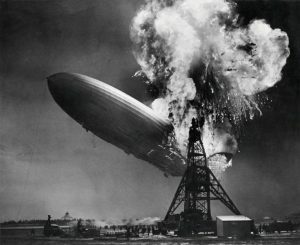 One of the first recorded pieces we still have access to today is the report about the Hindenburg disaster on May 6, 1937. Herbert Morrison’s eyewitness report about the crashing of the German passenger airship LZ 129 Hindenburg in Lakehurst, New Jersey wrote radio history. In their radio play “Crashing Aeroplanes” from 2001 Ammer and Einheit are explicitly referring to this authentic report, which, together with original recordings of cockpit voice recorders, they turn into a piece of art. In doing so, they stress the resilience of the medium of radio and of the radio play as an art form. Dieser Eintrag wurde veröffentlicht in Electronic Art, Mixed Media, Presentations & Talks, Radio, Theory von ania. Permanenter Link des Eintrags.